A packet consists of two kinds of data: control information and user data (payload). 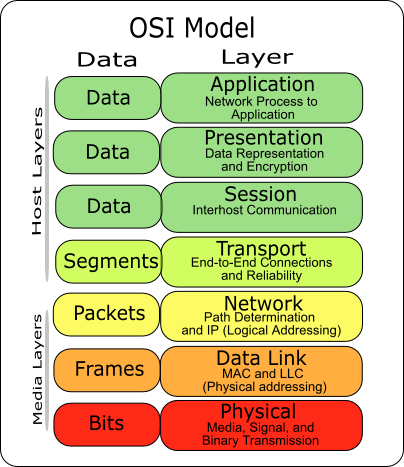 IP packets are composed of a header and payload. The control information provides data the network needs to deliver the user data, (Ex: source and destination addresses, error detection codes, and sequencing information etc). Different communications protocols formats data differently. In OSI model, a 'packet' refers to a a data unit at the Network Layer. In the Data Link Layer data unit is a frame.. In the Transport layer it's a segment or data gram. The term frame is used to refer to a packet at data link layer. The packets get encapsulated into frames so that they can be transferred over different media to the end destination. It is still the same data with a frame header.They are split up differently due to varying window size. A host computer simply arranged the data in the correct packet format, insert the address of the destination host computer, and sent the message to the Message Processor. Once the message was delivered to the destination host, an acknowledgement was delivered to the sending host. If the network could not deliver the message, it would send an error message back to the sending host. Explain how IP addressing works. IP addresses are 32-bit addresses written as four octets in dotted-decimal notation, such as 192.168.5.18. To communicate on an IP network, a host also needs a subnet mask, which may look something like 255.255.255.0. What DHCP and DNS do? On TCP/IP networks, the DHCP server can provide IP configuration information to hosts. A DNS server resolves hostnames to IP addresses. What are bandwidth and latency? Bandwidth is the amount of data that can go through a device or cable. For example, Category 3 UTP has a maximum bandwidth of 10Mbps whereas the wireless standard 802.11g supports bandwidth of up to 54Mbps. Latency is how much delay there is between sending a data request and receiving a response. Most network adapters and connectivity devices will have LED lights on them that are status indicators. If there is an active connection, the light will turn on. Many status indicators will blink if traffic is going through that port. What protocols do? and name common protocols. Protocols are the language of communication for computers. The most common protocol is TCP/IP. Other protocols you might see are NetBEUI/NetBIOS, IPX/SPX, and AppleTalk. What is the difference between simplex, full-duplex and half-duplex transmission? In a full-duplex environment, the devices can talk to each other in both directions at the same time. In half-duplex, only one side can talk at one time and the other side has to wait until the first one is done to send information. What is the difference between workgroups and domains in a network?A workgroup is often referred to as a peer-to-peer network, and there is no centralized administration. A domain is a server-based network, where the server (often called a domain controller) manages user accounts and security for the network. Workgroups are best suited for networks with 10 or fewer computers and low security requirements. What are common TCP/IP ports? A port is a special location in memory where we write and read data in communication. Some common protocol and ports pairs are HTTP (80), FTP (21), SMTP (25), POP3 (110), Telnet (23), and HTTPS (443). What is the difference between a LAN, MAN and WAN? A LAN is a local area network, which typically means a network in one centralized location. A WAN is a wide area network, which means several LANs in remote locations connected to each other. MAN is a metropolita area network connecting different places in a city. What hubs, switches, and routers are? These are all network connectivity devices. Hubs and switches are used to connect several computers or groups of computers to each other. Routers are more complex devices that are often used to connect network segments or networks to each other. Routers route data packets/frames received from hosts and other routers. A virtual private network is a network where computers are connected via a WAN connection, but the connection is secured and appears to be a LAN connection. How to identify Class A, B, and C IP addresses? Class A addresses will have a first octet in the 1-126 range. B is from 128 to 191, and C is from 192 to 223. What types of cables are used in networking and the connectors for each? What are the different types of broadband connections? Broadband connections include DSL, cable, satellite, and fiber optic. What is required to access the Internet through a dial-up connection? To use dial-up, you need a modem in your computer, a phone cord, a phone line, and an account with an Internet service provider (ISP). What are different IEEE 802.11 standards? Standards you should be familiar with are 802.11a, 802.11b, 802.11g, and 802.11n. What are the security mechanisms used for wireless networking? Wireless security mechanisms include WEP, WPA, SSID management, and MAC filtering. What wireless technologies that are available for data transmissions? Common wireless technologies are Bluetooth, infrared, Wi-Fi and cellular.